The Cambridge Dictionary online definition of the idiom “work around” is: a way of dealing with a problem or making something work despite the problem, without completely solving it. For months I’ve wanted to make baked beans. The recipe I’ve always used calls for a can of Bush’s Baked Beans. After scouring Walmart and another store that carries “gringo” food and not finding anything close with the name “baked beans”, I decided to do a “work around” – what is available in Guatemala that I can substitute for baked beans? There’s no problem finding beans (dried or in a can) in a Latin country, but which one is closest to American style baked beans? 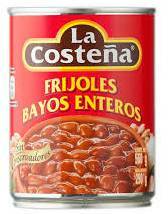 After searching online and studying the selections in stores, I took a chance and bought this can of frijoles. The second “work around” that I now faced is that my recipe calls for chili sauce. Again, after scouring several stores and not finding it, I looked online for DIY chili sauce and made my own. End result … I made my first “Baked Beans Guatemala” and the taste is yummy and satisfying. With this “work around”, I’m now able to make baked beans anytime I want! Idioms … I once heard a speaker say “to know a language is to know the idioms”. The English language is full of idioms or phrases that we use every day and don’t realize they don’t translate literally, such as “work around”. To a nonnative speaker, this is baffling. Spanish also has its own idioms and I’m challenged as I learn that it’s not a “piece of cake”! As I interact with my Guatemalteca friends, they know I’m attempting to speak in Spanish using its idioms, so they’ll use the common phrase “poco a poco” – little by little. And that’s exactly how language learning is – poco a poco!